Home is where the heart is, and Susan and Paul Haggar have extended theirs beyond four walls to the landscape that surrounds their two-story house. The Cypress couple have created outdoor living areas to complement the ones indoors. They can step onto a 75-foot-long loggia with dining and seating areas, lounge on a patio with pool and serve pizza fresh from the oven in the covered outdoor kitchen. They are able to take in more views of the 19 acres they call home from the balcony that tops the loggia. The Haggars settled in Texas 34 years ago, two days after they married in their native England. Twelve years ago, they fell in love with the Cypress property, which was then a school. "Converting the house and landscape has been a work in progress," says Susan Haggar, a photographer who finds the natural, whispering-wind-in-the-pines setting a calming influence on her portrait subjects. "The two-story house was something of a dorm clad in yellow siding, and my studio was a four-room school," she says, crediting her husband with the vision to design outdoor areas that add creature comforts and work with house's style. The Haggars exchanged the yellow siding for an Oklahoma sandstone that's brown to gray with shades of rust and chocolate. A mix of small to large pieces of the stone also clads the studio, patio and loggia. 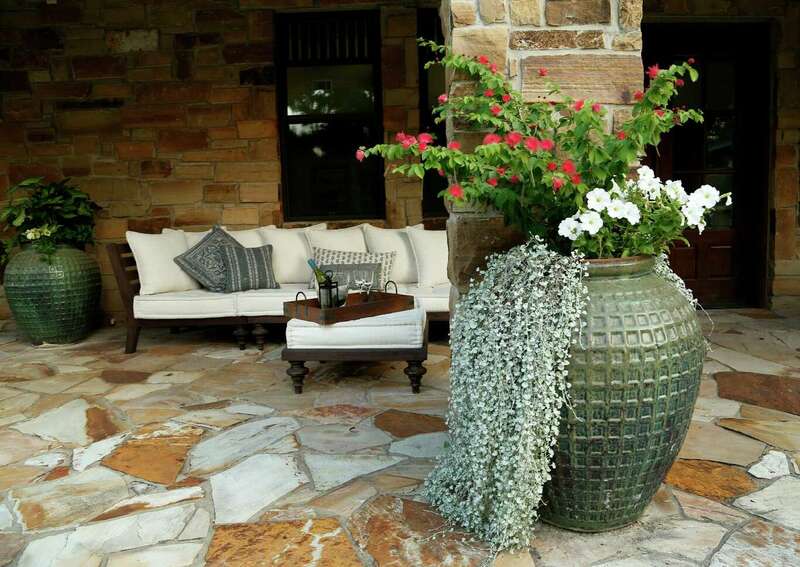 "We like Texas limestone, but it's a more absorbent material that gets green and moldy. So we looked for a stone that looks European and that wouldn't absorb water," says Paul Haggar, a steel broker. Once the choice was made, 24 semi-trucks delivered 600 tons of Oklahoma sandstone to the Haggars' place to give the buildings a unified appearance. The stone selection is especially fitting for the European-inspired arches along the loggia and outdoor kitchen. Extra-large containers with fuzzy-red flowers of calliandra, white petunias and cascading skirts of 'Silver Falls' dichondra bring life to the extensive hardscapes. Curving raised beds boost color around the patio. Yellow thrysallis and lantana, purple Mexican sage and orange hamellia provide months of nectar-bearing blooms. 'Knock Out' roses produce neon cherry red flowers nearly year-round, and juniper and rosemary add touches of low-care, fragrant evergreens to the sunny site. Citrus, peach and crape myrtle trees planted in a swath of green lawn along a white fence help define the outdoor living areas. Susan Haggar enjoys stealing some solitary porch time with wine and a book, but the couple also likes hosting family from England and small and large gatherings of friends for a barbecue. The largest, most memorable event took place last year when the Haggars further transformed their home and garden into a magical backdrop for their daughter's wedding. Guests gathered for the ceremony near a newly reshaped, picturesque pond out front. Then they dined and danced beneath chandeliers draped in beads and Christmas lights in a newly built, handsome barn out back.